Pyoderma (infection filled wtih pus) or a feline skin infection can occur on any part of a cat's body including the nose, face and skin. Infections tend to be secondary, which means that they are caused by another condition. A common secondary cause is allergy such as cat flea allergy, or cat food allergy. Other causes include an internal disease (hypothyroidism, hyperadrenocorticism), some type of skin gland disease (sebaceous gland problems ,or problem at the hair follicles), parasites (demodex canis causing mange mites) or some problem with a cats anatomy which predisposes the skin to infection such as skin folds." Feline skin infection can occur in a variety of forms, including both fungal and bacterial infections. Not every cat skin disorder is caused by an infection, however; there can be other causes of cat skin problems. 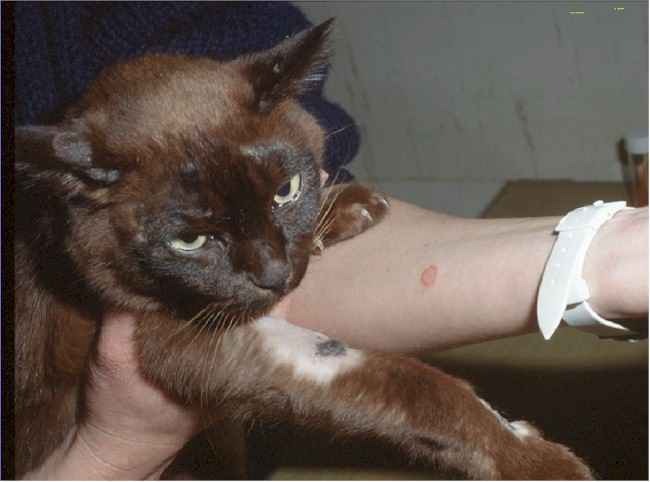 Infection often occurs when another condition causes cat skin itch, which causes the cat to scratch and introduce microbes into the skin, which results in infection. Many types of infection are also highly contagious and can be passed between cats. If a cat has skin folds, or lip folds, this creates warm pockets on the body which allows above average levels of bacteria to take hold (colonize) and cause infection. In general infections are treated with a combination of topical ointments, shampoos, conditioners and topical ointments. Note the ingredients that are required to treat your dog's specific condition and oral medications. The exact underlying cause of a feline skin infection will need to be diagnosed by your vet who can best distinguish one cause from another. In some cases, your vet will be able to diagnose the infection just by looking at it. In other cases, tests will be needed in order to determine the exact nature and cause of the infection. Tests may include examining the affected area under a special ultraviolet light, taking a swab of any seepage from the area to be examined under a microscope, and/or blood tests. If the cat has scratched the skin so much that it has caused the area to develop a bacterial infection. In that case, the skin infection must be treated, but the underlying cause of the itching must also be determined and treated as well. Treatment for a bacterial or fungal cat skin infection primarily involves the use of prescription and over the counter topical treatments as described below. Treatment is often a matter of trying different products until the patient responds. Cats with a mild problem can try a combination of an over the counter medicated shampoo such as ClinicalCare in addition to the use of a natural remedy described below. In addition to specific treatments recommended by a veterinarian, the use of homeopathic skin products could help to reduce the severity of symptoms and speed healing. These are not a substituted for specific therapies, but can help improve skin and coat condition. This includes the use of skin cleaning products such as VPS Wound Care which prepares the skin prior to the administration of a topical medication and topicals designed for specific problems such as Naturasil for Ringworm. Once healing is under way, skin and coat health can be supported with a remedy such as Skin and Coat Tonic. 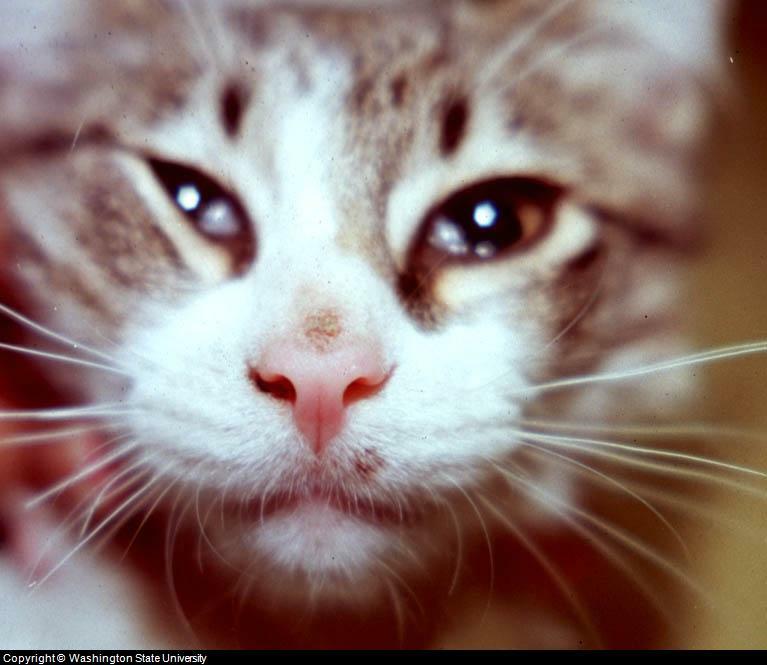 Feline skin infection caused by bacterial infection is treated with antibiotics. 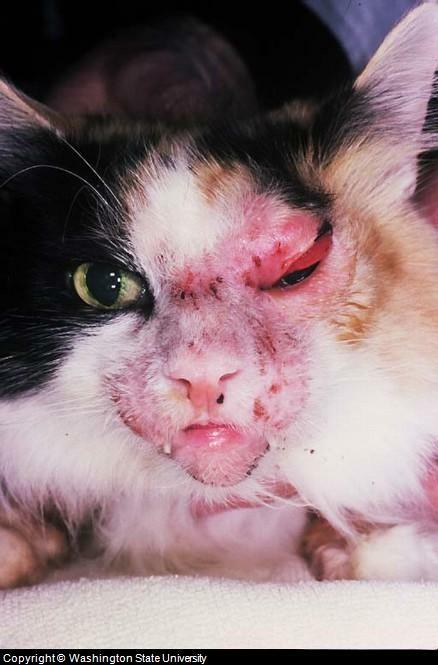 Minor skin infections are treated with topical antibiotics, while more severe cat skin conditions may require an oral antibiotic. Severe conditions may require 8 to 12 weeks of treatment. Antibiotics used include lincomycin, clindamycin, erythromycin, trimethoprim-sulfamethoxazole, trimethoprim-sulfadiazine, chloramphenicol, cephalosporins, amoxicillin trihydrate-clavulanic acid, or ormetoprim-sulfadimethoxine. 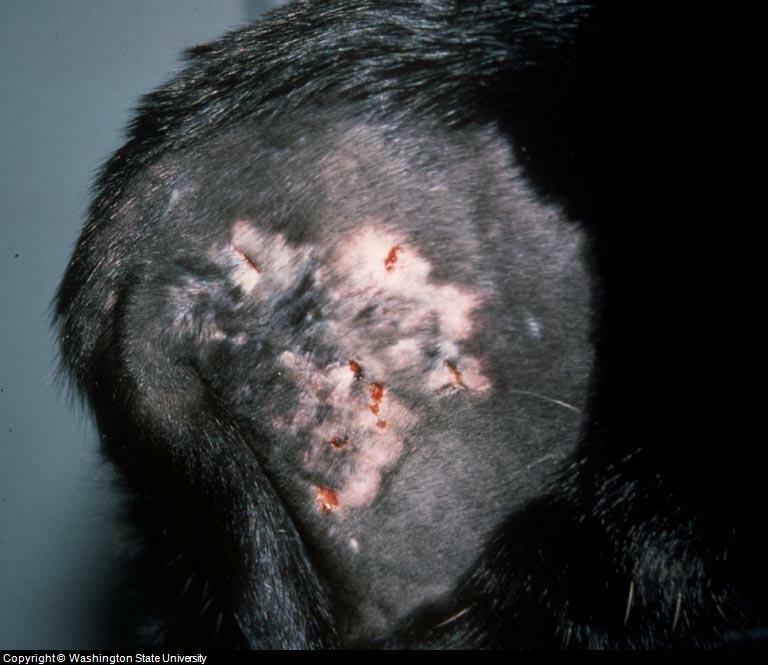 Infected areas should be kept clean, with the hair in long haired cats in particular clipped around areas that have deeper infections or puss (pyoderma). A natural cat skin product such as VPS Wound Care can help keep the area as clean as possible during healing. Fungal infection can either be on the surface of the skin or in the case of skin injury, the fungus has an opportunity to penetrate further. 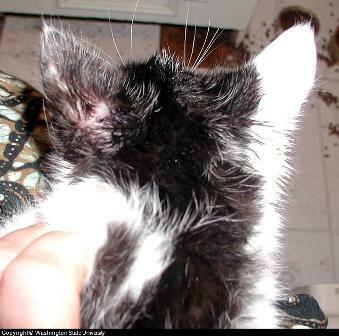 Microsporum is a type of feline skin infection cause by fungus that can affect both the skin and hair. A veterinarian has a number of topical (applied to the skin) prescription products that can help to eliminate a feline skin infection caused by fungus. These come in many forms including dips, ointments, lotions, sprays and powders. The medication griseofulvin is commonly used. Skin infections that are on the body are often treated with the use of a lime sulfur dip such as Naturasil and/or an anti-fungal shampoo such as ClinicalCare. Often treatment is experimental, with different products tried until the condition is brought under control. The reason for experimentation is that a variety of fungus may be resistant to the product being used. The goal is trial and error until a cure is found. Ringworm is not caused by worms but is a form of skin infection. It is appears as a round red patch with a pale center. It is highly contagious and can be spread between people and cats. Ringworm can be diagnosed with a fungal culture and examination of the culture under the microscope and an examination of the skin under a special light called a "Wood's lamp." The extent of the fungal infection will determine the best course of treatment. Mild cases will only require some type of topical treatment (treatment applied directly to the skin). More advanced cases require a lime-sulfur dip such as Naturasil for Ringworm. The oral medication Itraconazole is also used. Your cat needs to be soaked in the dip down to the skin. It is considered to be safe and effective. A treatment pack such as Pet's Best is formulated to cure ringworm treat dry and flaky skin, speed healing and reduce the severity of symptoms. The use of a gentle skin topical to keep the skin clean such as VPS can also be of help prior to the administration of any prescription products. Your veterinarian will retest your cat after 3 weeks and then again soon after to see if the ringworm has gone away. Treatment usually lasts for a period of 30 days including 2x treatments a week of the dip. Scott, D. W., Miller, W. H., Griffin, C. E.